Flashlight in hand and a lunch box, never thought that would be the best way to visit Angkor Wat. If you travelled from so far [as we did], I’m sure you want to experience the famous tourist attraction in Cambodia, and you must be prepared for it. 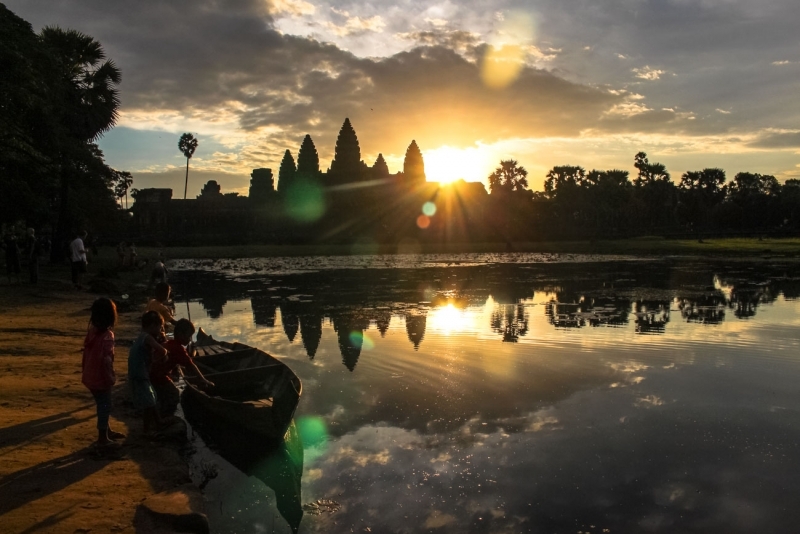 Angkor Wat Sunrise, beautiful, intense, full of people, touristic, however magical. The temples of Angkor Wat surprised us in so many ways. The orange morning sky was only one part of the show. The architecture, the energy, the children, and the monks give to that place an incredible atmosphere. I felt happy, a mix of Indiana Jones + Lara Croft discovering ancient ruins and ready to battle against the evil [the sun and the heat, of course]! Jokes apart, explore the temples of Angkor Wat is one of the top things to do in Cambodia and you don’t want [and can´t] miss it. We went to Siem Reap to visit the temples and to run the Angkor Wat Half Marathon, sport and sightseeing in one place. We stayed in Siem Reap for 5 days, in my opinion was a bit too much, as I didn’t like the city. But many people love it, so give it a try. If you have spare time like us, I recommend a visit to the Angkor Wat National Museum before going to the park, it will help you to understand a little bit more about the beliefs and the architecture of Angkor Wat. Surprisingly, I realize that the Buddhism in Cambodia is way more related to India than to the other countries in Southeast Asia. First things first, don’t buy Angkor Wat tickets or tours from unauthorized people. Don’t be a fool, and don’t believe that a taxi driver or a hotel receptionist can sell it for a better price or with a discount. I know you are really anxious to visit the temples and to watch the Angkor Wat sunrise, but trust me, leave the sunrise for your second day in the park. Unless you are visiting the complex in just one day, what is really a pity. There are so many things to do in Angkor Wat, that you should devote to this ancient ruins at least two or three days of your trip. Also, the temples are open air, in the middle of nature, so be armed with mosquito repellent, sunscreen, hat and bottles of water. Along the way you can find small stalls selling drinks and food, to avoid dehydration carry water with you all the time. Last, but not least, dress respectfully. Angkor Wat is more than an archeological site, it´s a temple, the symbol of a civilization and people´s belief, so cover your shoulders and avoid miniskirts. Don’t forget to follow the rules like smoking and eating in proper areas, don´t feed the monkeys and don’t go inside the barays [artificial lakes that surround the temples]. Be a sensible tourist! Said that, let’s move on, I´m going share with you the best way to visit Angkor Wat. 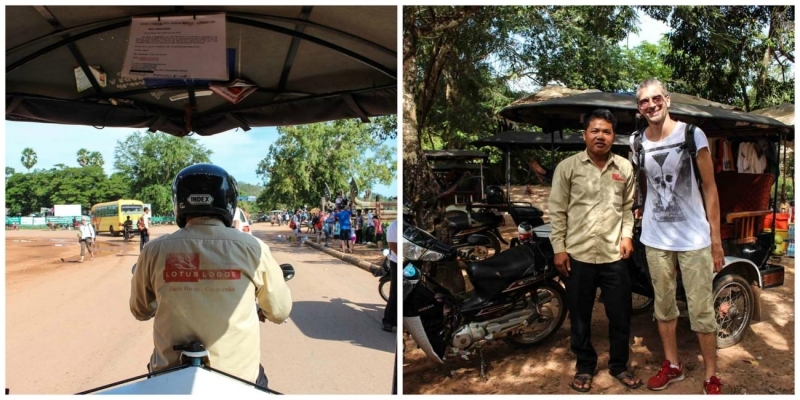 You can buy your tickets and hire guides [in English and other languages] from the official ticket booth on the road that connects Siem Reap city to the archeological site. Buy it just before starting the tour, there is no need to purchase it in advance. Be aware that if you want to watch the Angkor Wat Sunrise it might be a queue to get the ticket on the early morning. » Driver or Guide? How is the best way to get around Angkor Wat? To get around Angkor Wat you need a vehicle, no way you can walk the whole complex. Foreigners are not allowed to drive inside the park, so you must hire a bicycle, a tuk-tuk or a van driver. Bicycles are fun, but be prepared for long hours cycling and the heat. For a bicycle adventure you definitely need two or three days in the park, otherwise is impossible to see everything. We recommend you to hire a tuk-tuk driver. Ask to your hotel reception, they can recommend a trustworthy driver, talk to him and negotiate the price. We paid $18 USD for a day tour and $20 for the day we went early for the Angkor Wat sunrise. He picked us up at the hotel, and stayed with us until 6 pm when the park closes. If you find a nice and helpful driver, stick with him during your whole trip. It´s not easy to bargain with Cambodian tuk-tuk and taxi drivers, can be really tiring. If you want to understand and get deep into the Khmer civilization you should hire a guide [an official one, please]. Most of the drivers know a few bits and pieces about the temples, but I wouldn’t trust a full historical tour on him. Sleep well and go to the temples early in the morning, 8 am is a good time to start your expedition. Most of the temples have the best light during morning time, but don’t worry too much, the afternoon shadows over or inside the buildings give them a more dramatic vibe. For the Angkor Wat Sunrise, you must be at the complex around 5:30 am. Don’t be lazy or late, this natural spectacle is worthy. After the sunrise you can go and explore the other temples, later on we’ll share with you the best way to visit Angkor Wat and avoid the crowds! 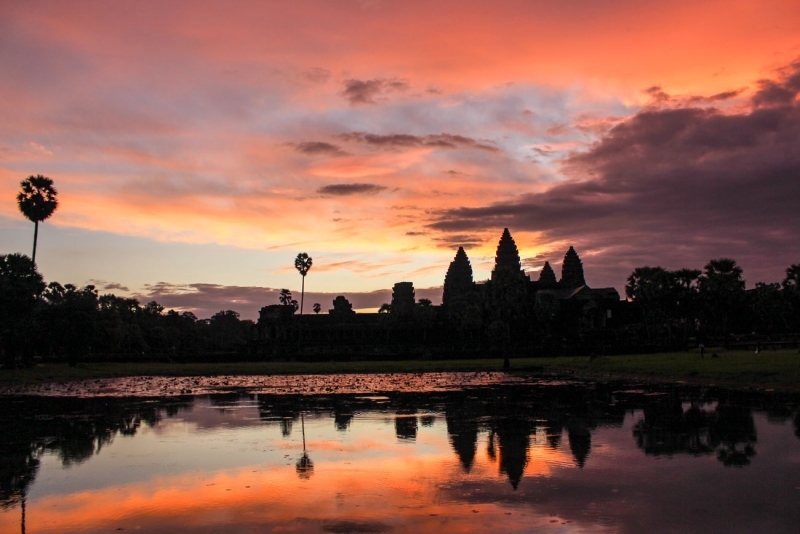 The Sunset in Angkor Wat happens between 5:15 and 6 pm. I suggest you to watch the sunset on your first day visiting the Angkor Wat temples, and the sunrise on the second day. The best time of the year to visit Angkor Wat is between November to March, what means mild and dry weather. Less heat, but more tourists. The rainy season starts in June and lasts till September, the place is lush green but can be hard to drive from one temple to another with frequent storms. Avoid April, unless you can handle freaky roasting days. Angkor Wat is a Cambodia must see attraction, so actually there aren’t high or low season. Siem Reap is full all the time, and so are the temples. We were there in December and it was busy & hot! » Which route should I follow? What is the best way to visit Angkor Wat? On your first day in the complex, I really recommend you to explore Angkor Wat and Angkor Thom. These two temples are huge and you have time enough to see all the details, climb to the top of the constructions, search for mystical inscriptions, and walk in the forest. Angkor Wat is fully restored and the religious art displayed there are unbelievable. I suggest you to get a map or a guide book of Angkor Wat. Start your walk at Angkor Wat temple itself [all the corridors, the different levels and the tower in the middle]. If you get hungry or tired, there are some small eateries beside the garden. Fill yourself with some energy and go in search of The South Gate, The Bayon temple, Elephant Terrace and Terrace of Leper King. 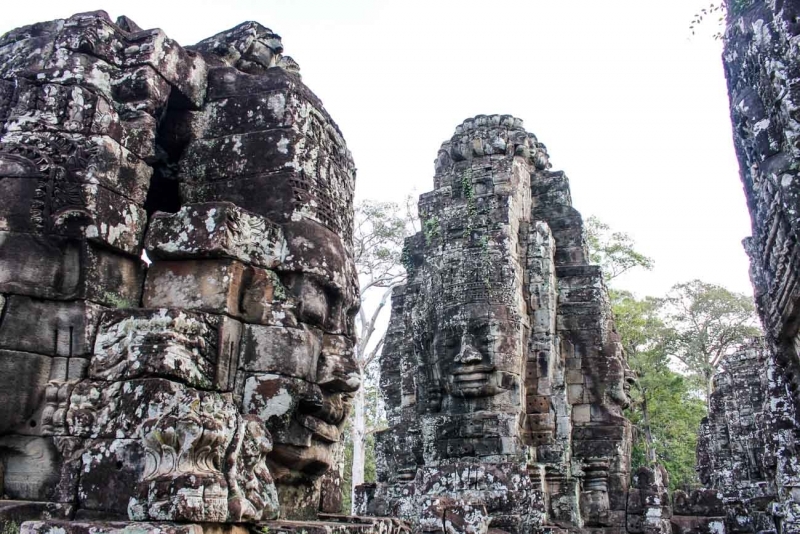 Angkor Wat and Bayon [temple of Buddha´s faces] are the crowdest temples, they are quite close to each other, and together with Ta Prohm [worldwide famous after Tomb Raider movie], are the top attractions in Angkor Wat complex. It doesn’t mean they are the most beautiful and interesting ones. You definitely need to venture yourself in search of the other temples. 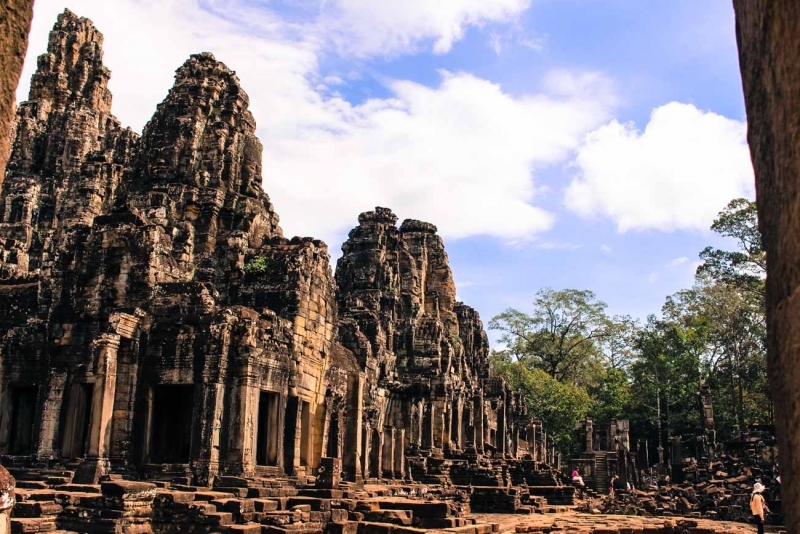 After Bayon go by foot to the Elephant Terrace, walk among the trees and lakes, you will breathe fresh air, listen to the birds and even be scared by some naughty monkeys trying to grab food and attention. I´m sure that by 4 pm you will be tired, sweaty and in ecstasy. 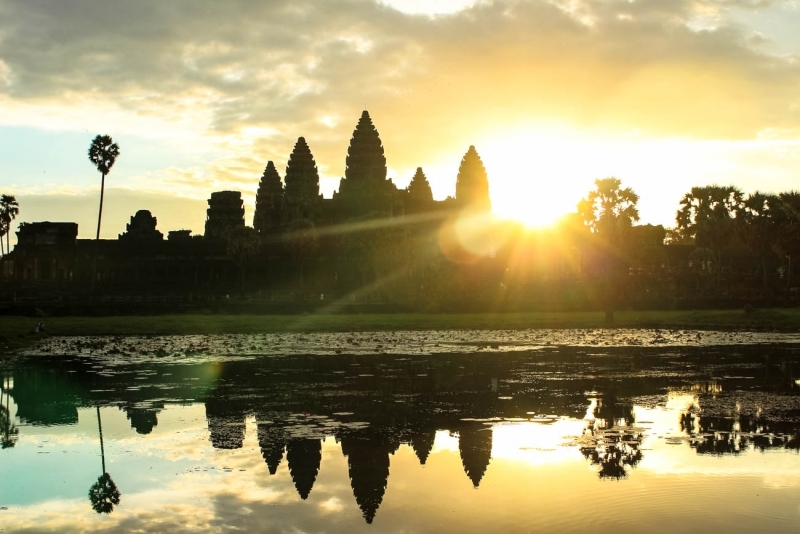 The second day is the big day, you must wake up early and enjoy the magnificent Angkor Wat Sunrise. All the details about this dark and adventurous expedition we’ll talk later. Let´s jump over the sunrise just to finish your itinerary. The best way to visit the complex is to start the big circle ride towards Banteay Kdei, opposite to Angkor Thom, where everybody goes after the Angkor Wat Sunrise. 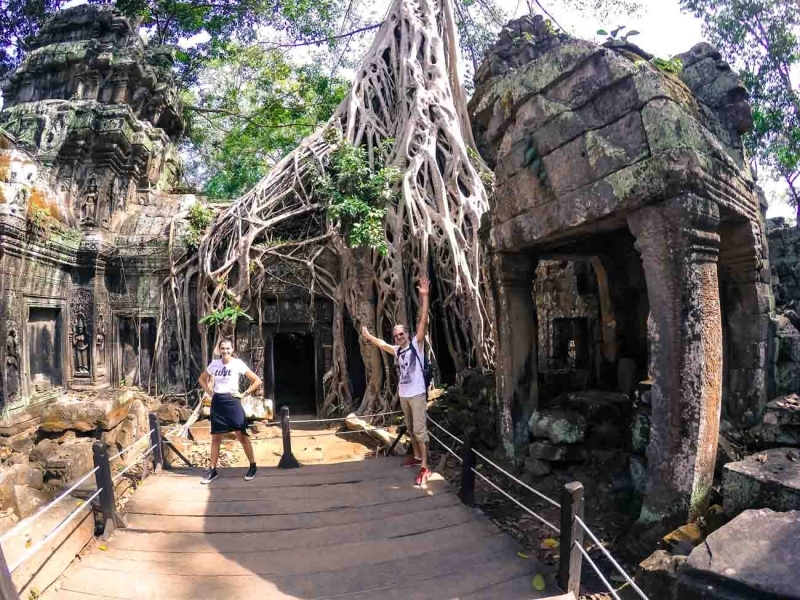 Doing this you will start your adventure in empty temples, and when you arrive at the famous Ta Prohm [by mid afternoon] it will be less crowded and you will be able to snap that awesome photo. As we were doing the tour in the opposite direction we had the opportunity to drive on empty roads, see some kids going to school and monks praying. Our driver realized that we were in search of unique moments, so he took us to some temples that the organized group tour won’t even mention on the tour leaflet. We stopped by Sras Srang, Pre Rup, Ta Som and many others. I remember we crossing this baray, all surrounded by trees, you couldn’t see what was hidden inside. We walked by this long bridge, the sun shining through the water, fishes jumping, flowers blooming, and the silence. I could only hear the “click” from our camera freezing in time that stunning scenery. At the end of the bridge, in the middle of the lake, a shrine. Like a fountain with elephants, lotus flowers and a few people gazing the majestic place. I’m not sure of how many temples we visited, and the names of all them. I know I should have written them down, but you know what, I prefer to tell you to go and explore by yourself. After two intense days, I learned that the best way to visit Angkor Wat is to follow your heart and your own path. Ask your driver to stop where you think is worth a photo, or a nap under the trees. Two days are enough to visit Angkor Wat temples, to get a hint of the Khmer history and architecture. If you buy the 3 days pass [as we did] you still can have a third ride around, go back to the temples you like the most or enjoy one more sunrise over Angkor Wat. It’s your call! We used our third day to run the Angkor Wat Half Marathon, one of the most beautiful and magical races we have ever run. It´s hard to choose each one is the most beautiful. I would say that the Angkor Wat Sunrise is more powerful, especially that you can witness the transformation of the dark night into a brand new day. Watch the sunrise on your second day, so no need to buy tickets on a hurry, you already know the road and how long does it take to arrive there. On the night before, when we were talking to the driver about the pickup time, he told us to ask the hotel to prepare our breakfast to go, so we could eat it after the sunrise. Such a clever idea! On the next day, when we stopped at Angkor Wat I realized that we have forgotten tour flashlight. Thank God our driver had two to borrow us. Those smart moves guarantee him an extra tip and a big thanks for being such lovely and caring driver. The place is crowded, people trying to walk around the ruins in a completely dark night. Hold your torch firmly and cross Angkor Wat main gate then you must find a spot in front of the building, on the left side of the bridge that leads to the temple. There will be a small lake with flowers, that is the place you want to be when the sky turns purple, orange, and light blue. The colors are so intense, when the show starts the crowd became silent. We could hear the cameras clicking, the self-sticks folding up and down, and tons of “Wooowwwww”. Don’t look only to the sky, pay attention to the lake too, the reflection of the temple and the clouds is stunning!! As soon as the sun appears people tend to leave the garden. Don´t rush! Now it’s time to find a good spot in front of Angkor Wat and savor your breakfast. Until 9 am the color of the sky will change, the clouds will play with the sun creating unique sunbeams. After breakfast go back to the tuk-tuk and start your second-day expedition in Angkor Wat complex. The sunset in Angkor Wat is beautiful too. The best place to watch it is at Phnom Bakheng or the Terrace of Srah Srang, from there you can see the sun setting over the forest. But I believe that from any temple you will have a great view, from the top you can see the sandstone buildings shining like gold. This is our best way to visit Angkor Wat, if you follow our travel tips I’m sure you will have a memorable experience too. You can do the tour on your own [as we did], or hire a guide, choose a group or an exclusive tour, there are plenty of them in Siem Reap. However, always double-check the references, be aware of scams and outrageous prices. You can find some reliable companies on Tripadvisor and even book a tour online. 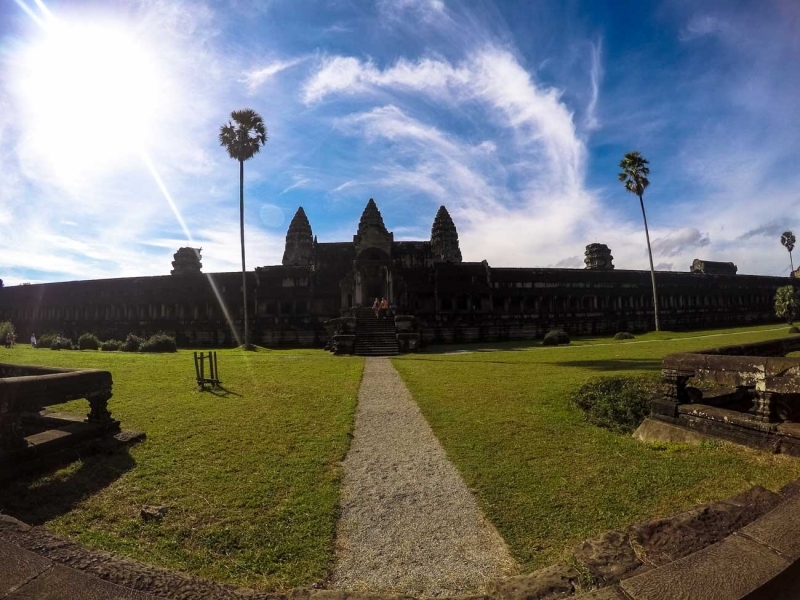 To finish our travel guide to Angkor Wat, here it goes some practical information about where to stay in Siem Reap, how to get to Angkor Wat and around. Siem Reap is the closest city to Angkor Wat attractions, and one of the biggest city in Cambodia, that means plenty of rooms options. Most of the hostels and hotels are near Angkor Wat, and it won’t take more than a few minutes to get from one place to another. I would say to choose your accommodation in Siem Reap based on comfort and budget. Almost all the hotels are close to the city center, easy to find restaurants, markets and near to all attractions and things to do in Siem Reap. We stayed at Lotus Garden a bit outside of town and can be hard to find the address but the property itself is great. I was glad to be far away from the messy streets of Siem Reap, but to leave the hotel we needed tuk-tuk or bicycles. I liked Lotus Garden, they have big rooms, a decent breakfast [and the lunchbox for the Angkor Wat Sunrise], swimming pool, tuk-tuk service, bicycles, and massage. All these for a fair price! For those who want to splurge have a look into Prince D’Angkor Hotel, Borei Angkor Resort, and Sokha Angkor Resort. Three gorgeous properties that will treat you like a king! If you are looking for a hostel, we can recommend One Stop Hostel offers comfy rooms, great atmosphere, and a nice rooftop bar. You have two choices, you can travel to Siem Reap by bus or by plane. It all depends on your budget and time. Siem Reap International Airport receives daily flights from almost all the big cities in Southeast Asia. For the best flight fare look at Kiwi and Skyscanner, they have a great search engine and an easy way to compare prices. The airport is close to the city, a tuk-tuk or taxi ride will take you to the hotel. Getting to Siem Reap by bus is not that easy or fast. Depending on where you are coming from this can be a long, hot and annoying trip. We have done it twice and as much as we tried to relax and enjoy, it was quite hard to not get angry with all the bribe scheme that happens on the border with Thailand. If you decide to travel overland you can check routes and tickets with 12 Go Asia. I could write a whole blog post about it. 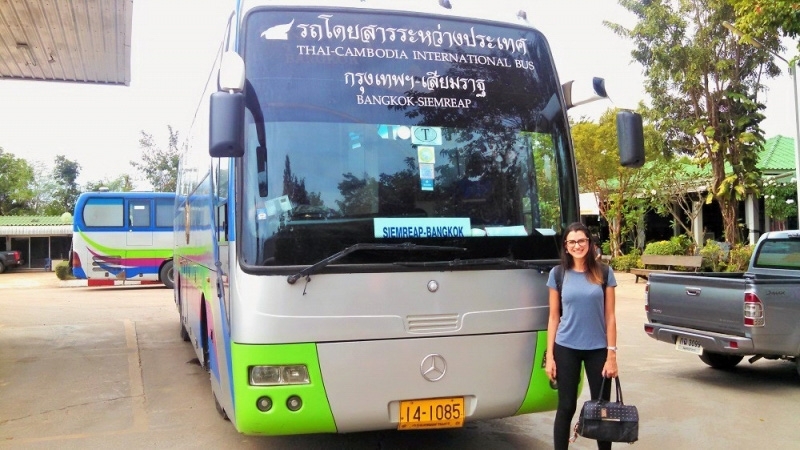 However, to make a long story short, there is only one company that cross the border between Thailand and Cambodia, without the need to change buses or get taxi and minivans. The company is OK, the price is fair, and the meal they serve is quite good. But when you stop by the customs on the Cambodian side to pay for the visa you discover a ridiculous scheme. The signs on the wall, the rules online, everywhere says it´s 30$ USD for a tourist visa single entrance, but the customs officers ask you to pay more and if you don´t pay in Dollars or Thai Baht you can´t get inside the country. That means: if you bribe, you are in. If you don’t, you are out of Cambodia. It´s not about money, I had extra dollars in my pocket, but it goes against my principles and I refused to pay. Bottom line, they hold our passport for one hour, we were seated there waiting for the answer, telling people not to pay more than the official fee. I think they got tired of us, and we were holding the bus on the border, so finally they give us the visa for the correct price. I was worried, threatened, but glad that we stood by what was right. The list of scams on the Cambodian border is long. People selling fake visas on the bus, companies that promise to take you all the way from Bangkok to Siem Reap but drop you on the border and then turn back to Thailand. Taxis drivers that charge a ridiculous amount of money to drive you from the border to the closest bus station on the Cambodian side. The visa bribe, and so on… Be aware, stay safe and look after your money. Sad to say but we didn’t feel safe in Cambodia, even though we had a great time in Angkor Wat. Now you know where to stay in Siem Reap, how to get to Angkor Wat, and how to avoid scams and problems. Even better, you know the best way to visit Angkor Wat! The complex was nominated by Lonely Planet as the best tourist attraction in 2015, and no doubt it is. I lack words to express how amazing our visit to the Angkor Wat temples was, and how happy we are for sharing it with you! Love it:! Pin it for later! Remember: go there with a flashlight, food, an open heart!! That’s the best way to visit Angkor Wat, Sunrise and Sunset! Are you ready to explore it by yourself?! 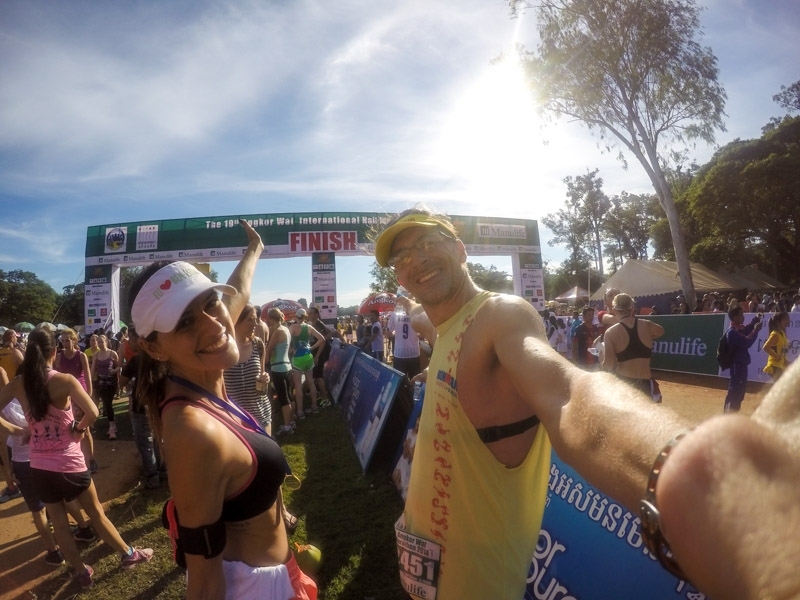 I only recently learned about the Siem Reap Half Marathon, and I’m dying to return and do it one day! It’s also funny that you mention how Buddhism in Cambodia is much more akin to that practiced in India than in its neighboring countries. My roommate and I visited Cambodia during a school break from teaching English in Thailand, and to our surprise, Cambodia for us recalled India more than anywhere else we’d been. The Angkor Wat Half Marathon is incredible. One of the most beautiful races we did so far. You gonna love it! Is really interesting how the cultures are linked, right? I love love your sunrise money shots. We went in April when the lake was almost dried up so getting these shots was a lot harder. We did get a funny photo of many many Korean package tours trying to take this photo though….! What a comprehensive guide to visiting Angkor Wat! Really great tips and advice, thanks. I *love* your photos, they are simply stunning. And congrats on completing the half marathon too – sounds hot!! Angkor Wat is stunning, that helps a lot with the photos 🙂 We loved the days we spent there, thanks for stopping by! What a perfect spot to see the sunrise! Congrats on completing the half marathon! Angkor is on many a bucket list for good reason, your guide is super helpful. I didn’t know that there was a half marathon at Angkor Wat, now that is definitely something to add to the bucket list! It looks so beautiful – I’d probably want to spend days there! This race is SOOOO beautiful!!! You gonna love it! Angkor was absolutely one of my favourite places and the temples definitely live up to the hype. I would second your recommendation of a tuk tuk (and more than 1 day!) and especially because the temples have so many stairs, riding a bike means … well a lot of exercise! And the heat! OMG! I love to exercise but dont believe is a good idea to spend the day riding a bike around those temples under the heat. 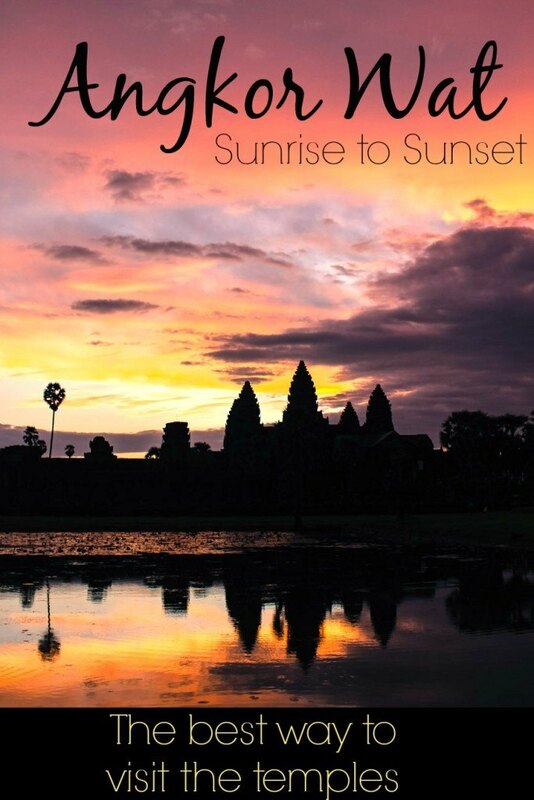 I’ve always seen pictures of the sunrises and sunsets at Angkor Wat. It looks like such an interesting place, and I didn’t realize it was so big! I would love to go there one day and get a little off the beaten path like you did. It would be great to see the daily lives of the people there as well. I’m glad you had a nice trip! We really enjoyed our time at Angkor Wat. It`s a magical place! Great point about bringing mosquito spray. It’s the last thing we think to bring but most regrettable to forget. The mosquitos over there are awful!!! We took literally thousands of pics! Amazing photos mate. We were supposed to go to siem reap this coming december. I can only dream when I can visit siem reap and see this magnificence. Every moment there was magical, the place is stunning!!! Thanks for stopping by and glad that you liked the photos! * Angkor Wat is the name of one temple-city complex, the whole park is called Angkor Archaeological Park. * there are hundreds of temples, so I’d recommend people spend a minimum of 3 days (although many people are starting to spend at least 5-7 days). 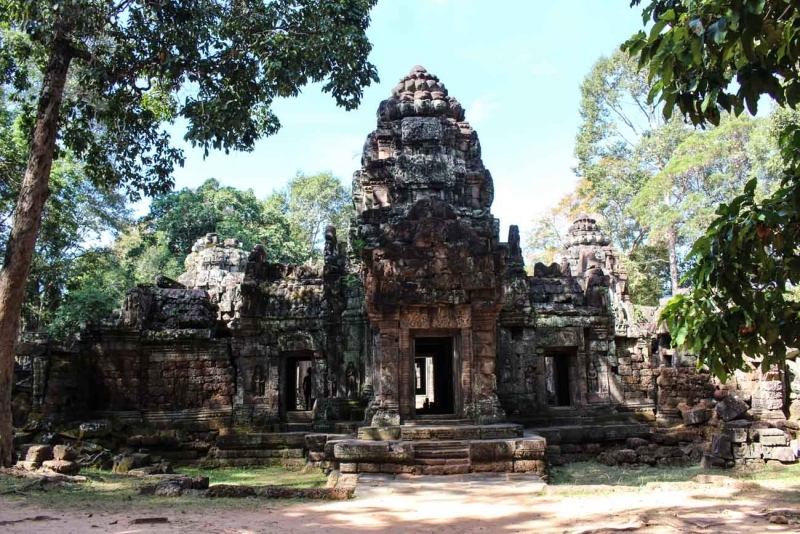 * it’s definitely important, as you point out, to get to more off the beaten track temples like Banteay Kdei, which you visited (isn’t it lovely?) 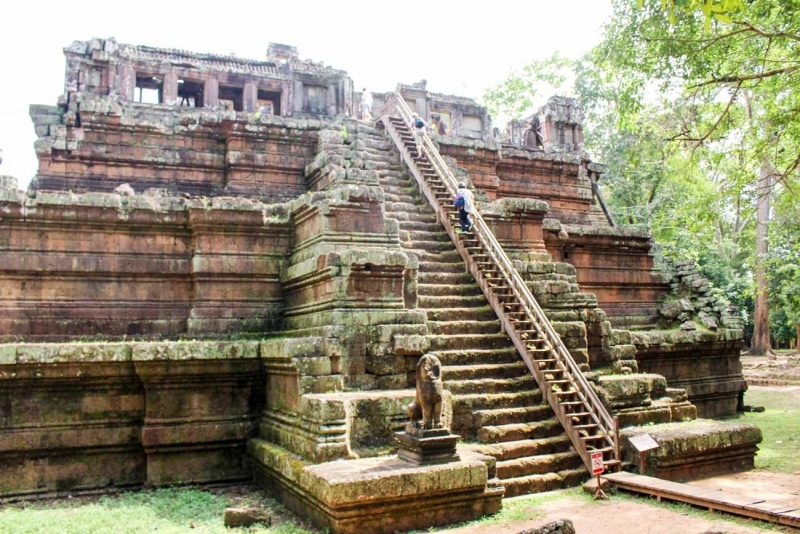 and also temples further afield, like the Roluos Group, Banteay Srei, Beng Mealea, Koh Ker, and Preah Vihear, which can be visited on day trips. * ignore all the ‘advice’ from the Thais on the bus and at the border about where to get visas, and just proceed directly to the Cambodia Immigration Visa Office – do not stop anywhere else on the way. * if people take the exact money in US$ (which is the requirement) for the visa, and hand over that money they’re unlikely to find the immigration officers will keep the change for their lunch money. * if people aren’t taking the direct government bus, and haven’t arranged a driver/car in advance, I strongly recommend getting a group of people to share a private car while they’re waiting in line at Immigration. Four people will be comfortable, but five is possible. Then once through actual Immigration ignore the touts trying to coerce you onto the free bus to the bus station, simply walk right by them, and go directly to the taxi drivers in the plain unmarked cars and tell them you want to go to Siem Reap for $40-50 (depending on whether you have 4-5 people). They’ll accept and they’ll move fast to load your bags in the boot, as they risk a fine for parking there if they don’t, so help them along and hurry to get in the vehicle. Using a driver/vehicle is cheaper than the bus/shared taxi from the public bus station and way faster. Do let me know if you ever get to Siem Reap. I also craft bespoke itineraries for visitors here and would be delighted to introduce you to ‘my’ Siem Reap, which is a wonderful place. Thanks for stopping by and your complementary info! Great!! Cambodia has such an interesting history and culture, I’m sure living there you can have a deep understand of it! We took the government bus, and it was ok, my complaint is not about the scams around the board when people try to “sell” you visas. My biggest problem was with the Cambodia Authority on the border, the ones that are meant to keep us safe and give us the visa on arrival. Those people were intimating the travellers and asking for bribes, and because we stand by what was right they hold our passport and threatened us for one hour. We gave them exactly the 30usd per person (the official price written on the signer over the counter) but they asked for more money. 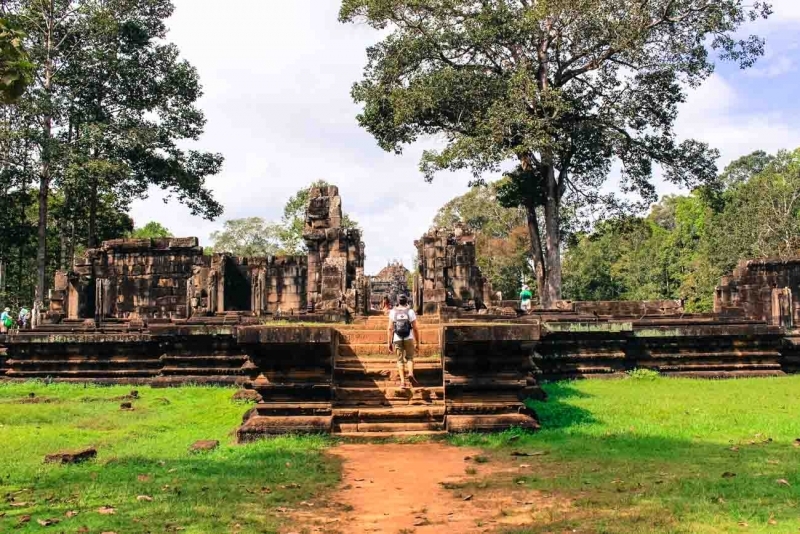 This first impression of Cambodia was awful, and I have to be honest with you, as much as I loved Angkor Wat and had a great time exploring the country by bus. I’m not sure if I would cross the border by bus again, we did it two times and on both occasions we had this awful bribe situation. Can be just a few bucks per person, but at the end of the month the lunch money turns into a big amount. Plus, its is wrong! You can’t tell the tourist that are visiting the country that bribes and scam are fine. Sorry! I did the big circle too but on a bicycle, and it took all day. The shrine at the end of the causeway that you visited is Neak Pean. Personally, I preferred sunset at Angkor Wat. It wasn’t as crowded as Bakheng or Pre Rup and the light paints the stone in pretty colours. Being in a thunderstorm for sunrise didn’t help! You can actually buy the tickets at 5pm and check a couple of places out without using any of your given days. It´s is one of the most beautiful places in the world, for sure!! Hope you can visit soon and enjoy all the history and stunning nature of Angkor Wat!! God guys, your pictures are great!! Glad that you liked Marine!! Love this post! I just got back 9 days ago and this article is chock full of GREAT ADVICE and your pictures struck such an emotional chord with me. The temples are surreal and magical! I highly recommend the use of a local guide as we got so much more out of the experience than we would have otherwise! Also – I can’t believe you guys ran a marathon here… it was so damn hot when we were there. Echo the shout out for Monkey hostel and recommend you check out X bar for Sunday night live music jam and the half pipe on the rooftop! Too fun. Thanks for the tips Pam!! It´s always good to have more suggestions! Angkor Wat is amazing indeed, and we had so much fun exploring and running around there, even with the horrible hot weather! Thanks for all the information and tips. We are planning to visit in May with our two children. I will definitely come back and reread your suggestions! Glad you liked the tips and found them helpful! I´m sure your kids will love Angkor Wat! It is such an interesting and magical place! Hope you have a good time in SR! I was there many times I never paid more than $ 20,- for the visa at the visa office before the immigration, dont pay more – be stubborn. The trick what they do in the visa office is they tell 1000 Baht and after if you dont have a passport photo (most dont have) the squeeze another 10 out. So it is under your control, take 2 passport photos with you and you save $ 10,- The idea of the $ / Baht is not a Cambodian one thats a US, UN and NGO mix up to keep inflation at bay. Usually the usual Cambodian people are even less corrupt than the Thai the corrupt ones are the officials everywhere in the “state apparatus”. The photo we took at the Jayatataka Baray, the wooden bridge gives access to the Neak Pean Temple. It’s beautiful there, and the day we visited was quite empty! 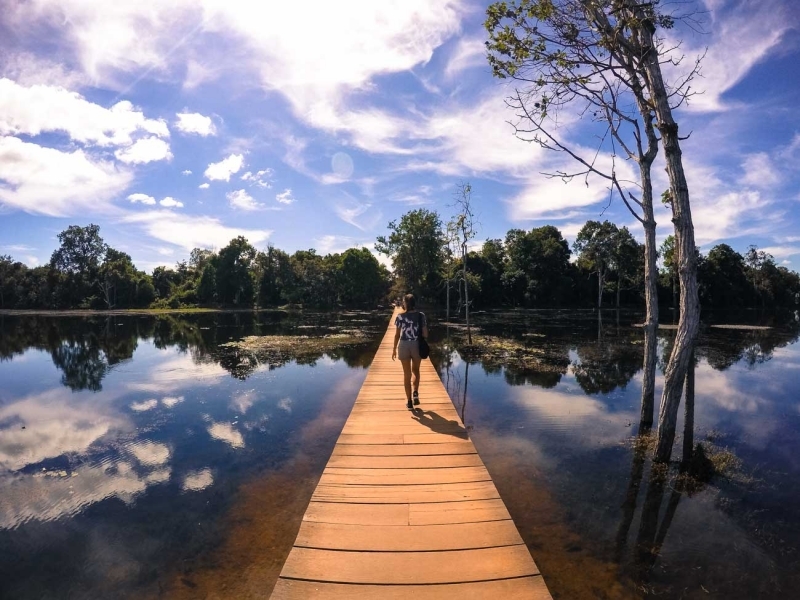 what part in siem reap in your picture with lake and wooden bridge? i like that picture 🙂 thanks! Wow, I really enjoyed reading your post. Glad to hear that you liked the post!! If you need any info let us know! Couldn’t agree more with you, Angkor Wat is amazing and another temples are also interesting. I took 3 days private tour with one of local tour company I found on Tripadvisor. The price were reasonable and their service was professional. They made our trip enjoyable and hassle free. So glad you enjoyed Angkor Wat! Oh I loved Angkor Wat! I actually been there twice and i love strolling around the area. Angkor wat is magical indeed! Great Blog guys, really helpful ahead of my 3 night trip to Siem Reap soon! Really good insight and now just need to decide whether to book a driver or a tour, but like the way you guys did it with your own spin so may side on that! Enjoy Angkor Wat, it’s an incredible place! We love to do it by ourselves, on our pace. I rather book a driver than a group tour, unless if you want to have some in depth explanation about the temple, so a experienced guide would be better. Thanks for the heads up Linda!! Already updated the information on the post! 😉 It sounds like an expensive experience, but we believe is worth the money. Angkor Wat is stunning. Great article! So helpful! Thank you! Love the post! 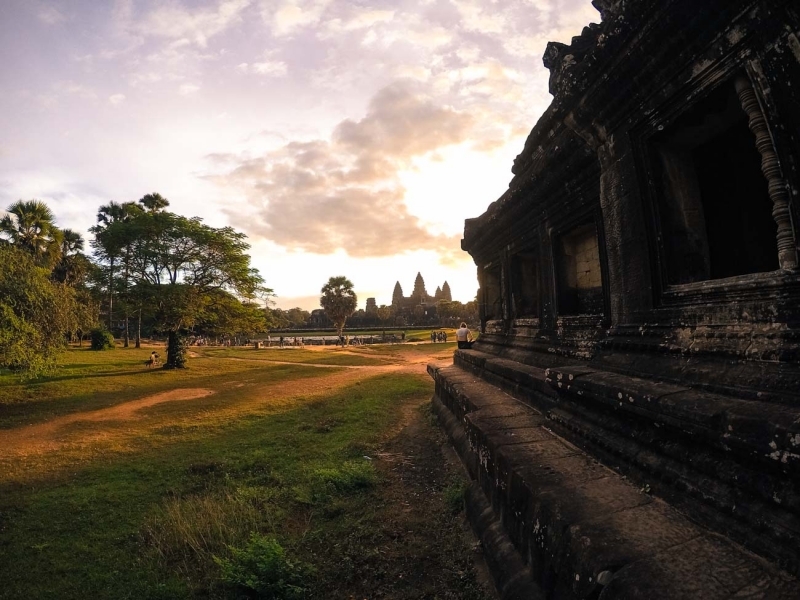 If you only had one day to explore Angkor Wat, which areas would you suggest as necessary to see? Amazing photos and great useful post! Thanks for doing it. Glad you liked! And enjoy Angkor! Thanks for the wonderful blog… very helpful!! We are looking to visit this December and I hope to find my own (empty) secret temple! Thanks for that tip! Hope you will enjoy angkor Wat! Very informative and makes me sooo excited to visit tomorrow! Thank you!! We would like to watch the sunset at Angkor Wat in late January. – i know it closes at 5:30pm, so doesn’t that mean I won’t get the chance to watch the sun completely set and that they will kick us out before the sun sets? The guards don’t allow people to enter the complex after the closing time. They are quite flexible with people already inside the complex watching the sunset. If you want to watch it from Phnom Bakheng go there before 4pm, it gets really crowded. i am asking specifically for Angkor Wat Temple, not Phnom Bakheng. So i am assuming I should be able to watch the sunset inside the temple if I am already exploring that afternoon? At Angkor Wat Temple the guards could be a bit more strict. Even though I think it’s worth the risk. If that’s the case, then how come a lot of people say if you get your ticket after 5pm the previous day, they can watch the sunset at Angkor Wat Temple… so confusing! Maybe you could try calling the Angkor Wat Visitor Center to clarify this issue. Thank you so very much for the tips and the beautiful pictures!!! My husband, daughter and I are going there in July for 5d4n. Do you have names, emails and or phone # for your tour guide and the tuk tuk person? Thank you so much for the very helpful post! I was just browsing the web and doing my research for a trip to Angkor Wat and how I should go about it since I have never been there before. Was really lucky to stumble upon your blog , especially since I was looking for infomation specifically for sunrise/sunset Angkor Wat runs with a driver. you wrote for day 2 “The secret to avoid the crowd is to ask him to start the big circle tour in the opposite direction” not really sure what this meant since I myself has never been there so a map on google would be really helpful. Also your guide seems to be really good , taking you to secluded and hidden gems, by any means do you have his contact to share? Also what is the best place to be for sunrise and sunset? Unfortunately we didn’t keep his contact. Suggest to ask a good driver at your hotel reception. I am doing my research about Angkor Wat Complex since I will be there for three days by the end of this month and your post is the most helpful by now 🙂 but I have only one question, as I was searching to make a pre-booking for tuk tuk and prices are way more higher than 20USD, I know that prices can be changed since 2015 🙂 but still, the best offer which I found is half day tour with tuk tuk for 82$ for two from 1pm until 6pm, so I wanted to ask you did you book your tuk tuk driver directly on the reception after your arrival or before? USD 82? Wow! Maybe this is with a guide and a driver? I would say to book when you arrive, if your hotel offer only expensive options head to travel agent in Siem Reap. 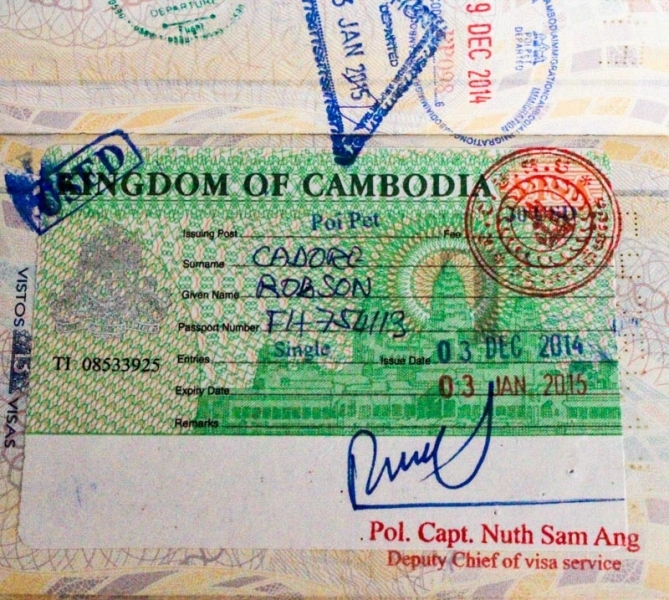 I experienced the scam for entering the country at Siem Reap airport. The visa thing wasn’t a problem. But the airplane ran out of entry cards. Once you get your visa, you then go thru customs and you need the entry card, to enter. So the customs agents are at each end of the entry hall. Both wanted $5 for the entry card. I went back and forth between them for 1 hour. Finally one gave in and give me 2 entry cards. We finally left the airport 2 hours after the plane landed. Every else had left 30-40 minutes before us. To say how aggravating this was….it was the WORST arrival experience I ever had. I did not walk out of airport happy at all. All in all, our time in Siem Reap was very nice, with the exception of this entry card thing. But it surely was a scam, as only 2 other passengers were treated the same way. I know now that to make a scene with all the other arriving passengers are there. Your card will be presented asap. It’s incredible how a country with so much potential for tourism fail to control this kind of corruption. Thanks for the post. We are going there in 2 days! Super excited about it! Have you heard about purchasing a visa online before you start the trip and printing it out to take with? It is possible but the onlive Visa is way more expensive and valid for some borders only.